The team compiled this data from researching publishers in 11 verticals (automotive, business, education, entertainment, finance, food, health, lifestyle, news, tech, and travel) via recent articles, LinkedIn, and Google+ profiles. In this excerpt from their Guide to Publisher Personas, we detail how to investigate and apply these four essential publisher traits, and provide an example from the research. Formal education levels vary widely among writers, publishers, and editors. You may find that some influencers have earned advanced degrees in their subject area, and that others have risen to publishing prominence out of a leisurely pursuit. 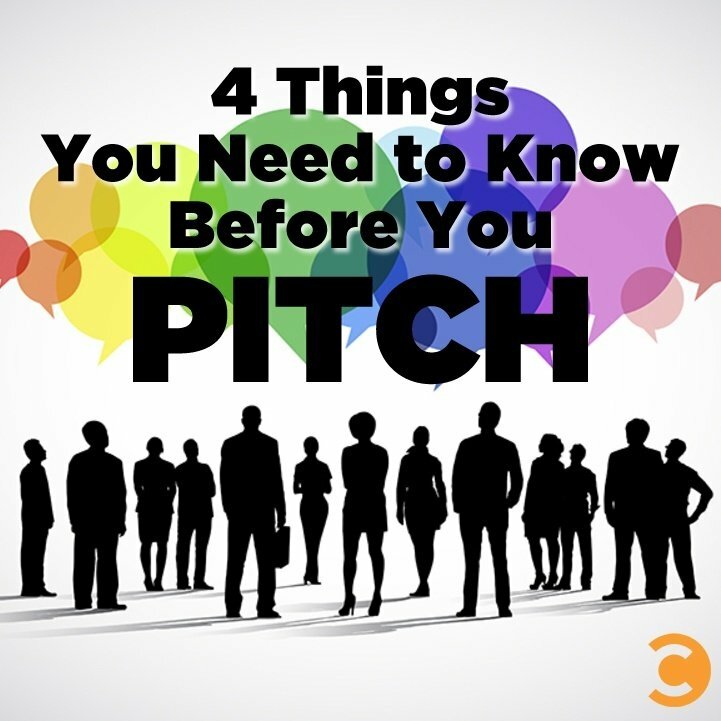 Understanding educational background can help you determine the tone you should take in your pitch and even give insight to help make a personal connection. Where to learn: LinkedIn is usually one of the best sources to help you learn about a potential contact’s educational background. You may also find useful details on a publication or personal website’s bio page or in social media profiles. 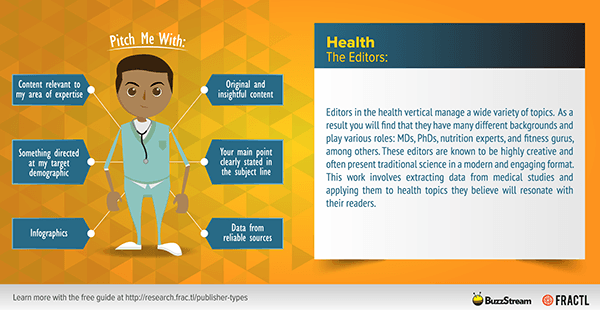 Put it in practice: Business, finance, and health editors are usually very well educated and highly specialized within their field. Learn which specific aspects of their subject area they cover, and consider them experts. Similar to educational background, an influencer’s employment history can also help you understand how much she or he may already know about your topic. 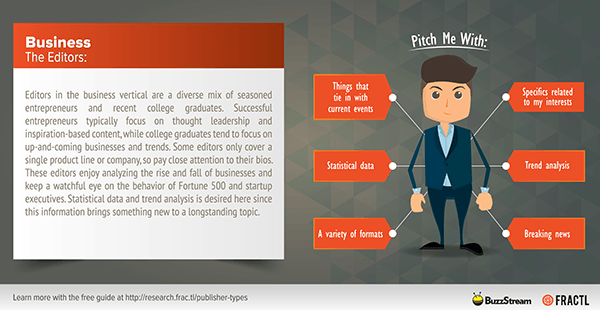 Their work history can also help you learn how established your potential contact is at their publication, which may influence your pitching chances. An editor who has been working with a publication for a long time has likely established a wealth of connections and may therefore be more difficult to reach with a new outreach effort; however, these people can also carry quite a bit of clout because of their longevity in the vertical. Those who are relatively new in their positions may not have inboxes as crowded as their more tenured counterparts, but they may also have a smaller audience and less social media impact. Where to learn: LinkedIn, bio pages, and social media profiles are again the best sources of information about past and current employment statuses. Monitoring all three channels is helpful in this case; there can be rapid turnovers among journalists and bloggers, and some sites may be updated more frequently than others. Put it into practice: As part of your outreach plan, count on needing to spend more time crafting and following up on pitches to well-established publishers. Work history can also help you understand how experienced an influencer may be in your vertical, giving you insights to guide whether to include more or fewer background details about your topic. Is the publication geared toward a general or specific audience? Does it run a regular column on a particular topic? If you are pitching content for a column, find out whether the column is targeted towards a niche within the broader vertical of the publication. Does the publisher cover many topics or focus more narrowly on a few specific issues? 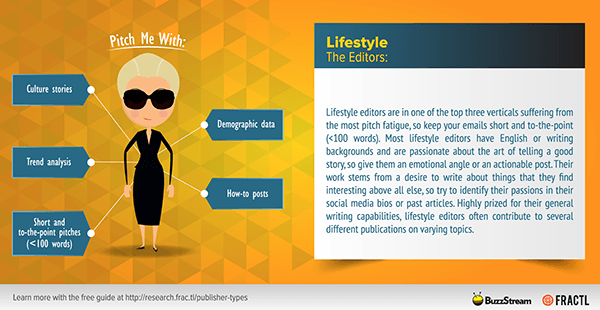 Does the publication’s target audience match the target audience and goals of your campaign? This last question is the most important question to ask from a strategic perspective. If a campaign’s goals include increasing social shares, and you pitch to publishers who have very low social engagement, you won’t get very far in reaching campaign benchmarks. Similarly, if the purpose of the campaign is to drive conversions, but you don’t place content with publications where people with buying power will see it, you are not likely to meet your lead goals. Where to learn: The best place to learn about the target audience is from the publication’s website and social media. The topics, tone, about section, and profile description will give you clues on how broad or narrow the audience range may be and who the publication is intending to reach with its content. 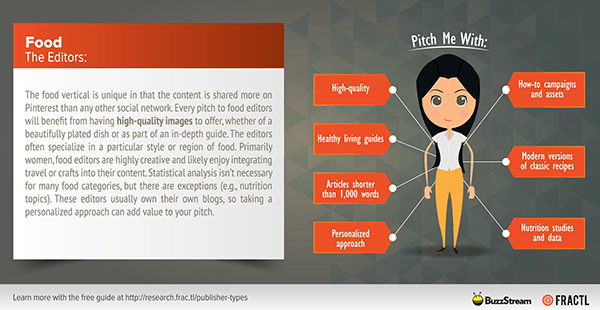 Put it into practice: Understanding a publisher’s target audience is essential for determining whether there is a mutually beneficial relationship to be established from your pitch. Research the readers to learn whether they will likely be receptive to your content, and whether a placement with the publication can help you meet your campaign goals. These assets can be even more valuable if the influencers you’re targeting have a large social presence. In another study on social traction, we learned that 51% of shares in the food vertical are earned on Pinterest, making high-definition images particularly attractive for publishers in this field. In the same vein, 21% of shares in the business vertical happen on LinkedIn, which may make data visualizations more desirable for these publishers. Where to learn: First, visit a publication’s website to learn which asset formats it publishes most often, and be sure to note the dimensions and any tech details that might be relevant, such as whether they commonly use interactive features. Next, check out the related social media channels to see if any asset types receive significantly more engagement or shares compared to others. Put it into practice: Offering publishers assets that you’ve researched to be both attractive to their audience and compatible with their website platform will automatically boost their interest in your pitch. It may take you a few extra steps to learn which asset types will work best for the publication, but investing the time and effort will pay off in both placements and social shares. Once you’ve researched these four aspects of your target publishers, your notes may look something like the examples we’ve shared in this article. Want to see the notes we’ve compiled on publishers in seven more verticals to help you get started with your own research? Download our guide for free. Kelsey Libert is a Marketing VP and partner at Frac.tl. She is a viral marketing and media relations speaker, and she's published on the Harvard Business Review, Marketing Land, HubSpot and Buffer. When she's not at work, you can usually find her at the dog beach with her two dogs.